Beautiful Lilac Breasted Roller bird in flight. Ndutu, Tanzania, Africa. The lilac breasted roller bird is a difficult bird to photograph in flight. It flies quickly and erratically. 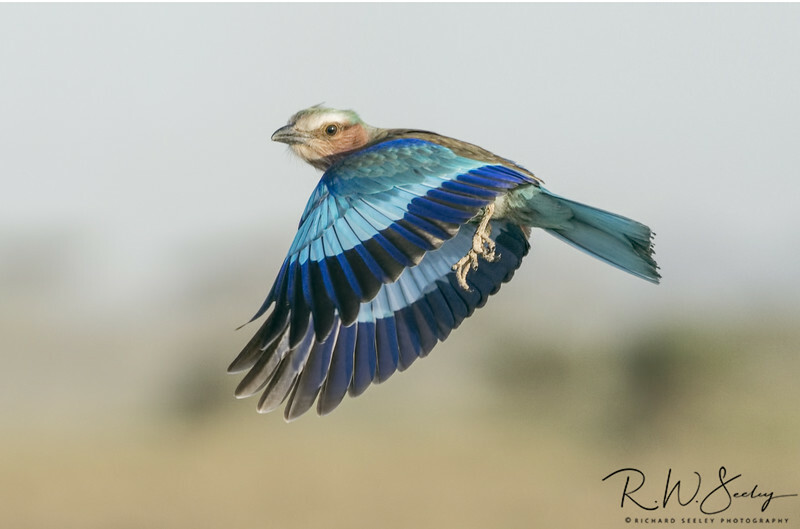 While standing in the safari vehicle we drove and scanned for the bright, beautiful blue colors of the roller bird. Trying not to disturb the bird we would drive to as close as we dared. Then we waited for the bird to fly. I was rewarded with these flight shots. Beautiful Lilac Breasted Roller bird in flight with wings down. Ndutu, Tanzania, Africa. The lilac breasted roller bird is a difficult bird to photograph in flight. It flies quickly and erratically. While standing in the safari vehicle we drove and scanned for the bright, beautiful blue colors of the roller bird. Trying not to disturb the bird we would drive to as close as we dared. Then we waited for the bird to fly. I was rewarded with this flight shot. Wings down is my favorite position.